I Need A Nurse, STAT! In the United States, we are facing a major nursing crisis, unlike anything we have ever seen. If you're in the healthcare industry, you already know this and you’re living this nightmare each day. 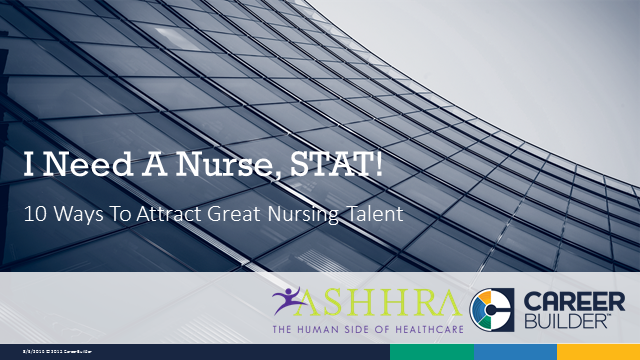 Your recruiters are beyond frustrated in trying to fill openings, only to have more nurses leave every day. So, what can you do? Join us for a webinar hosted by Tim Sackett, SPHR, SCP- HR Professional, blogger, and President at HRU Technical Resources, Tim will outline 5 things you should be doing to fill your nursing openings. Sackett ran talent acquisition at a major health system prior to the recession and will share his own insight, exclusive CareerBuilder data will be analyzed via Healthcare Global Solution Architect and Executive Member of ASHHRA, Jason Sacramento, and Cathy Henesey, ASHHRA Board member and Director of Talent Acquisition & Workforce Planning at AMITA Health will join to weigh in on the topic. Webinar attendance will count toward CHHR credits through ASHHRA. Title: I Need A Nurse, STAT!